As we near the midway point of this holiday-shortened week, we are going to be taking a look at a fresh earnings related options idea with UnitedHealth. The company just posted an impressive across-the-board earnings beat, while the chart itself was already in a prime bottom-bounce position. We are going to track the UNH Weekly $232.50-237.50 Calls, which should be in very good shape if events play out as expected. We also signaled the FAST 04/18 $62.50-67.50 Calls, last Thursday following the company’s own earnings beat. The moves we’ve observed since then have been moderate, but still impressive nonetheless. With not a lot happening on the premarket earnings front this morning, we are looking elsewhere for potential opportunities. 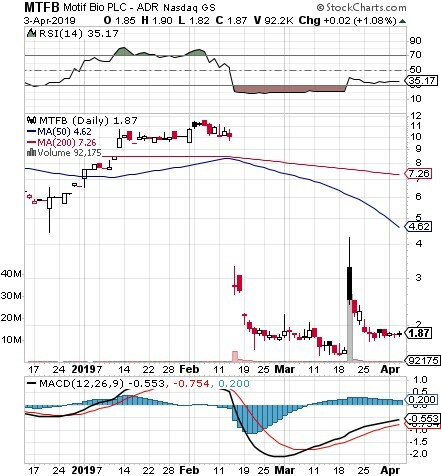 We’re interested in the current setup on MTFB, which from the current are, seems far more likely to see a big increase than a big decrease at the present time. There is an absolutely massive gap to the upside on the chart as you can see. Should it move to fill that gap once again, we could be looking at a significant chance for gains here. We also want to point out the prime bottom setup on LQDA, which was a $20 stock just a month ago. Now trading at half that amount, there is a gap on the chart that needs to be filled here as well and all indicators are pointing to a strong possibility of that happening sooner rather than later. We will reserve a space on our radar for this play over the next several sessions. 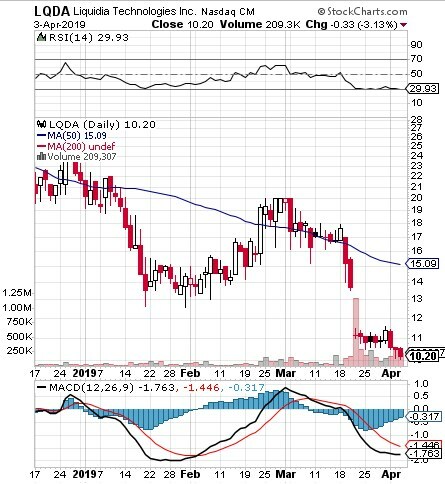 LQDA could very easily return to the $15-level relatively soon without a problem. 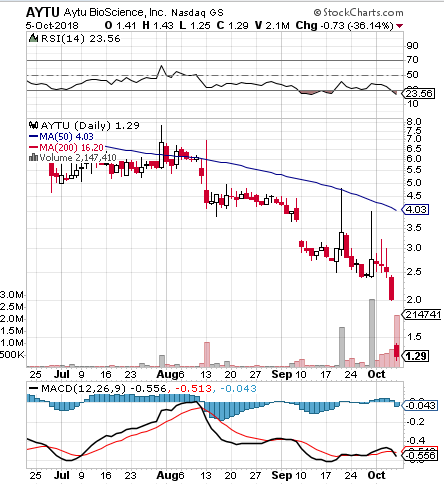 We’re always on the lookout for a bargain, and we may have a prime bottom play opportunity in AYTU in the near future. The stock has been on the downtrend for a couple of months, and is presently very heavily oversold. We’re going to put this play on our radar and watch carefully for a bottom-bounce which appears to be imminent. Gaining back even half of the ground its recently lost would mean more than a dounble from the current PPS. We’re also looking at the SPY today after a lackluster finish to last week. Market sentiment still appears to be bearish as we ready ourselves to kick off this fresh trading week. We are going to be tracking a set of bearish options, particularly the SPY 10/08 $288.50-$287.50 Puts. Keep in mind that these expire at the end of the day, thus should be treated as weekly options on a Friday. Only expert traders with disposable income should attempt these kinds of trades. On Friday morning, we closed out our premarket report with a fresh options trading idea for the HOME options chain, with the HOME 04/20 $30 Calls. The idea paid instant dividends for our readers and ourselves as those calls traded in a very solid range from 1.20-3.75 on the day, giving us the chance at intraday gains of up to 213% There’s obviously plenty of time to continue tracking this play, but as it is, we’re extrmely pleased with its single session performance on Friday, which registered as the sixth biggest gainer on the NASDAQ. Another target we selected last week for a bottom-watch play after noticing the chart setup and a string of insider buys, was AYTU. While it didn’t exactly blast off yet, we wanted to go over the move it did make, and reiterate our interest in tracking this play as we kick off this short trading week. Subsequent to our alert, the stock traded in a range from .4118 to .51, a modest 24% rise, and still has tons of room to run. In fact, the company will need to promptly reach and maintain a 1.00 PPS or risk having NASDAQ forcibly de-list its stock. It was a few weeks ago on the 12th of January that we signaled a range of puts in the Kodak options chain. The company had seen a considerable surge in price after announcing its own unique crypto-coin, but we took a skeptical position as to its sustainability. We highlighted the KODK 02/16 $15 & $12.50 Puts. 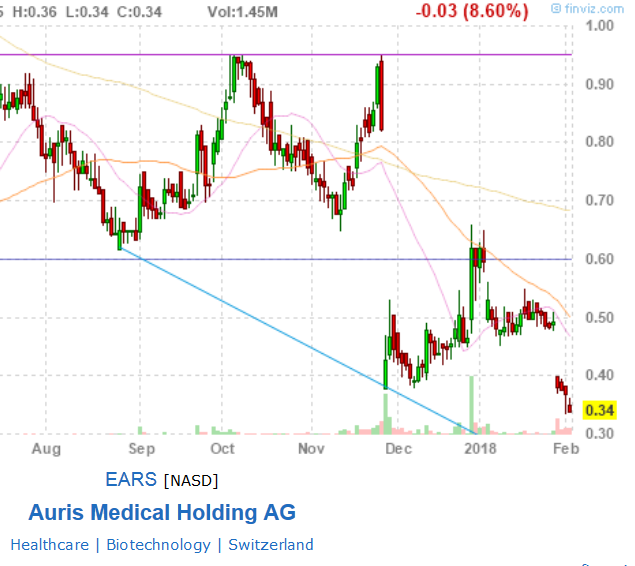 and wanted to come back around to it this morning to check out the gains that were made possible as the stock has predictably failed to maintain its uptrend, and instead has fallen significantly since our alert. We lso want to add a quick bottom watch play in EARS to kick off the week this morning. It’s got multiple gaps to fill to the upside and is currently considerably oversold. We’ll want to watch this stock for a potential rebound in the days and weeks ahead.